How To Win The Pick 3 Lottery - ish! The best you can ever hope for with most Pick 3 games is a fairly small win. And that’s the big prize! But those lower tier prizes arrive regular enough to keep you playing… after all, you won again this week right..? What happens to those small wins? They’re so small, they just go back in the machine. But you never win big, because there simply is no big with the Pick 3 lottery. Sure, you can play Pick 3 just for fun. But if you’re playing for the jackpot, then you’re playing the wrong game. For most players, one of the main reasons to play the lottery is the chance of that ‘big win’. The life changing jackpot. Pick 3 type games can never give you that. The real way to win the Pick 3 lottery, is to stop playing it and choose a better game. But take your typical Pick 5 or 6 game. Not only do they have life changing jackpots pretty much every week. These games also have plenty of those smaller prizes too. Now the odds are going to be tougher than they are with Pick 3 for similar smaller prizes, but they won’t be radically different. But what you really gain is the chance of winning the bigger prizes too – at no extra cost. Wisely choosing the right game to play (for you) is the most important step any lottery player can take. So how do you choose a better game to play? Get my free lottery tips – and I’ll show you how exactly how, and take you through specific examples. Don’t just play what looks the shiniest, or has the biggest jackpot when you reach the lottery terminal. Because that doesn’t make it the best game for you. I like the pick 3 lottery, I don’t want to make a fortune playing the lottery I would like to just have fifty bucks in my pocket. But presumably you mean always having a spare $50 in your pocket, rather than just one $50 in a lifetime..? If winning $50 just once ever would make you happy for life, then stick with Pick 3. Otherwise it’s just not a good game choice. It costs the same as playing games with vastly bigger prizes (that also have smaller payouts) yet you can never win big. And despite the glossy sales pages, nobody wins Pick 3 regularly enough to make a profit from it. But how many people that try to win the millions ever do? They spend their money forever and don’t win. People who do win millions have a lot of problems and are not happy. Have you ever won a lottery worth millions? Don’t be swayed by our negativity driven media. Dozens and dozens of new millionaires are created by lottery games every single week all over the world. The vast majority of them are perfectly happy – but that’s considered a ‘boring’ story by newspapers. The winners who have problems are usually the people who had problems which money just amplified. I bought so many lottery systems but none of them were any good but I still kept buying them. But that’s over with, no more, since I got advice from you. Thank you very much. Hey, I was wondering if I should stop playing the Cash 5 and start playing pick 3 and pick 4 in order to win more often? I enjoy playing the Cash 5 but it seems like I always hit 2 numbers but no more than that. I have hit 4 numbers before but I can’t seem to do that anymore. Any thoughts? Why do you think you would win more often? The odds of a match 2 on Cash 5 are 1 in 9.6, but the best chances of winning something on Pick 3 are typically around 1-in-100..! Hey LG, I don’t know why I thought that. I didn’t really realize how high the odds really were in the Pick 3. I appreciate your feedback though. I try plenty time no Aaron avail, can you give any advice, have a nice day. Your saying sounds good but I will see. Sorry Leroy, I have no idea what that means?? I win a lot, I learned some simple free systems using math not computer systems that you might buy. It’s easy, I play the same number 100 times and have twice won almost 10,000 on pick 3. Lately it’s been challenging for me so I have not played much. I play a lot less now due to the changes in the lottery systems. Seems more doubles and consecutive numbers are screwing things up. So I am playing low for now until it straightens out. I started low, just a dollar or two on a number, then had a good hunch on a number and took the chance with 13 plays on one number and one, so that gave me more confidence and I bit the bullet stuck 100 down on my next good hunch and won big. 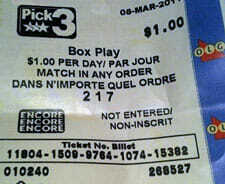 That my friends is how you make money at the pick 3 lotteries. Just go to lotterypost dot come and you will see all the other people doing the same thing. I learned fast because I am good at solving puzzles, that’s what this is. It’s like a puzzle when you chart the numbers and break them down, you can then see all the patterns. And you are then able to guess really good at the next number due. Sometimes you know for a fact it’s 2 numbers and you have to guess at that third, in that instance you would just play all ten possibilities and you win 100 for just 10 bucks. That is not a way to make a living but as you go you get more confident like I did and you take more chances. I have a good job and so I can afford to spend 100 dollars on a chance. Not every one can. So you start small and build, play on paper first and get good at it, it took me 2 months to get good, I did spend all day, some days studying these charts that I created myself using systems that are all over the internet for everyone to learn, for free. I could never teach it because it is my own version of these free systems. Everyones mind works differently. You could also be the type that can see the patterns and learn how to watch. It’s all learned by doing first. I learned as I played. Wwo months of losing and then I started to win. Now not so much cause like I said the system loops. It goes in cycles, once a consecutive number comes out, then lots of doubles follow and for some reason that screws up the charts. Others doing it for a long time have learned to get around this. I am learning, this week I had a break thru. I think my mind is more clear this month for some reason. Because I was able to see how the system is now jumping back and forth on my charts whereas before it was just going forward, well that is hard for me to explain so I’ll just say that every couple months you need to readjust your systems. Just google lottery systems, and the word system only really means methods, ways of charting your numbers, doing math workouts, etc. Systems sounds like software you might buy, but it is not. That was my confusion at first. So to those who think you cannot make money at Daily 3 are wrong. You can, I made almost 20,000 in one month, ssooooo there’s that. Sorry, but I think you’re fooling yourself here Angela. As do many people who play Pick 3. How are your results any different to just luck? How much have you actually spent in total? How do you explain that it seems to work, then it doesn’t? “It goes in cycles” just sounds like random luck to me. The thing about proof is it would be giving over your system which would be dumb as hell. If you give it over then everybody wins right up till it is shut down because everybody is winning. I don’t have it but if I did I wouldn’t tell a soul! Not at all. It’s really easy to prove. You can deposit your picks with a trusted 3rd party, who only reveals how much was won after the draw. It actually already exists – and is used by thousands of people who are convinced they are learning to beat Pick 3. Yet the results show none of them are in-profit for more than a short time. Hey LG, is Fantasy 5 a better game than the rest, just curious? Not necessarily. It’s a better game than Pick 3 for sure. But it depends how big a jackpot is ‘big enough’ for you. Game choice is a personal thing so the answer is not the same for everybody.